In a first for medical science, rats were able to breathe and oxygenate their blood using lungs that had been grown in the lab. 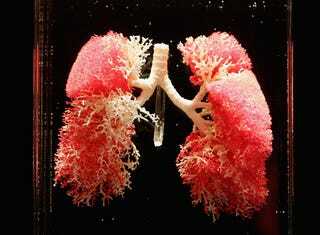 This a major step toward being able to grow replacement organs. Led by biomedical engineer Laura Niklason, a team at Yale constructed the tiny lungs for rats using a relatively new process called "decellularization." By rinsing organs in detergent, all the cellular material is washed away, leaving behind a fibrous, white structure that can be used as a scaffold to build organs out of fetal cells. The researchers used decellularized lung scaffolds, and grew new lungs with "a mixture" of fetal rat cells which formed tissues and blood vessels while the scaffolds were inside a bioreactor. The bioreactor - much like the organism-growing "vats" from many science fiction stories - was filled with circulating fluid, to emulate a fetal environment. And after 8 days, the scientists had fully-functioning lungs that could inflate and fill with blood just like naturally-grown lungs. To determine whether the new organs worked, the researchers removed rats' left lungs and stitched in lab-grown replacements. X-rays showed that the implanted lungs were inflating, though not fully. Tests of gas levels in blood flowing to and from the replacement organs showed that they were taking in oxygen and releasing carbon dioxide at 95% of normal efficiency. The researchers allowed the animals to breathe with the lungs for up to 2 hours before euthanizing them because of blood clots. "We've shown that it's possible to engineer a lung that can perform the single most important function-exchange of gases," says Niklason, whose team reports its findings online today in Science. She describes the results as one advance in a "20- to 25-year project" and cautions that a huge obstacle lies ahead. Researchers need to identify cells-possibly adult stem cells from the patient-that can reconstruct lung tissue without provoking attack by the immune system, the problem that plagues current transplant recipients. Other researchers have suggested one of the problems was that the lungs were immature, and that perhaps they should have been kept in the bioreactor for a couple of months before implantation. We may be two decades away from growing functional, replacement lungs for humans, but this experiment was an incredible proof-of-concept. We are another step closer to off-the-shelf body parts.